Located quite close to Makassar, Gunung Tondongkarambu is the highest mountain in the Bantimurung – Bulusaraung National Park area and the peak is at the northern end of a long, steep ridge. The area was first explored by Alfred Russel Wallace in 1857 and is the second largest karst area in the world (the largest is in China). Although most people know the area for caves and waterfalls rather than for mountains there are a couple of good hiking options in this very picturesque region, including both Tondongkarambu and the more popular and shapely Bulusaraung (1,353m) which is actually often visible from Makassar airport. It’s a stunning area and the roads weave round near-vertical cliffs into the very heart of the hills. You will find very little litter indeed, for few hikers use the trails except local hunters and wood-cutters. Apparently there is a small village named Tobalo in a remote part of the national park just a few kilometres north or northwest of Tondongkarambu whose inhabitants (‘orang balo’) are eleven albinos. It is said that this number must stay the same, so should one inhabitant die, a new albino from outside must come and take his or her place. Conversely, presumably, should an albino arrive at the village, there will be a total of twelve and therefore one must die. It must be wondered what might happen should a ‘bule’ (foreign white person) arrive in Tobalo! It is a very mystical place. Until now, we have not yet heard of anyone other than local hunters having reached the true peak of the long Tondongkarambu ridge. A moderately more popular trek is up to the southern end of the ridge to what we might call the ‘southern peak’ (1,440m). It takes only around 3 or 3 and a half hours to reach this top from the foot of the mountain, but, although it could be done as a day-hike, one night camping in the forest is probably much more enjoyable than staying in the villages. The trail to the lower southern peak starts in the remote village of Bonto Masunggu (580m). From there, a path leads over a stream behind the houses, through the peanut fields, over a couple of fences and a short bamboo bridge (620m), past a house with a metal roof (665m) before entering the forest at 735m. From here, the views over to Bulusaraung are magnificent. The trail continues past a large rock (790m), across a log over a small stream (850m) before reaching a wider stream, presumably more like a river during the rainy season (950m). The latter is a good place to camp if you have started late in the day as it is only an hour from the villages. There are actually a few crabs (Parathelphusa genus) living in the mountain streams here. If it is still light, it is recommended that you continue over the stream and up the steep slopes of the mountain and camp on the pleasant ridge instead. Look out for gaharu (agarwood) trees in this area – endangered fragrant wood, endangered because it can fetch a very high price for use in incense and perfumes. There are some excellent views a little higher up (from 1,290m onwards) and soon enough you will have passed some large rocks (1,360m) and finally reached the ridge itself (1,410m). From here it is only 300 metres (15 or so minutes) along the ridge to the southern top (1,440m) of Tondongkarambu. There are some wonderful views over the edge of the ridge. Alas, you are still about 3.5 kilometres south of the true summit which is about 250 metres higher. If you are brave enough you can climb the old, mossy tree near the southern peak and view the true peak from the highest branches. 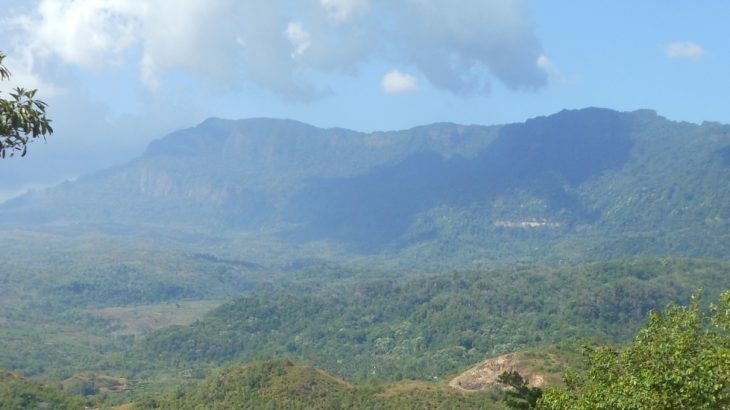 To reach the true summit would take an extra day of machete work from the south, so it is probably better to attempt the true, more northerly, peak from Kampung Tokela, a village a couple of kilometres further north from Bonto Masunggu. Apparently there is a trail up to the true peak, though it is very steep indeed and should really only be attempted between August and October when dry weather is most likely. As you will see, there are plenty of places on the ridge which could easily be turned into suitable spots for small tents to be erected. It’s a lovely area, not too high to be too cold, and often with a nice breeze and lovely views over the edge of the steep cliff. If you would prefer an alternative route back down from the southern peak to the stream campsite area, there is one but it is very, very steep in places and less well-defined but does offer some stunning views. This route leads back down a little further along the ridge – you should hopefully spot some blue string tied to branches which you will have seen further down on the way up. The section at 1,330m is particularly steep so be very careful indeed at this point. Further down, just 15 minutes away from the stream campsite, is a cluster of trees with beautiful bark – resembling eucalyptus. From the southern peak back to the village should take no more than 3 hours. After the inevitable long-winded chit-chat and something to eat you can be back at the airport in under 3 hours in good conditions so theoretically this hike could be done in a regular weekend from Jakarta. Let’s hope it is not long before more information is found about the elusive true summit further north along the lovely, wild ridge. Getting there: The region is close to Makassar city and even closer to the international airport although the mountain is deep within the national park area. Allow 3 hours to reach the foot of the mountain from the airport or 4 hours from the centre of the city of Makassar. There are two routes to the mountain, both from the main road leading north from Makassar and the airport. Both are rather quiet and can accommodate cars as well as motorcycles, major sections having been recently re-surfaced (2013). The southern route is longer (more windy) but it perhaps easier to follow (turn off the main road near Pangkep near the KM48 distance (from Makassar) stone, past a white and green mosque and then follow the road through Desa Panaikang, Desa Balocci, the Bulusaraung signs and steep section of road (Bulusaraung is on the right of the road), Desa Tompo Bulu, Desa Bonto Birao before making a right turn towards Bonto Masunggu at the foot of the mountain itself. This is the best route in. The faster, more northerly, route heads the other way at the junction for Bonto Masunggu, and leads via Desa Bantimurung, Desa Malaka and Desa Mangilu before reaching Tonasa. The main road to Makassar is reached at the crossroads and mosque at Bungoro (turn left back to Makassar). Accommodation: Lots to choose from in Makassar. KG (Kanaka Giana) at the entrance to the old airport (bandara lama) is a good choice for those not wishing to stay in the centre of the city. Other than one or two penginapans on the main road north, village floors only available closer to the mountain. Permits: Not required, but local people will probably want to accompany you. Water sources: Unknown for the route to the true summit. There is water available on the trail to the southern top at 850m and 950m (the latter being a reasonable spot to camp at despite only being one hour by foot from the villages). ‘Tondong’ means hill or mountain and ‘Karambu’ means buffalo in the local language therefore Tondongkarambu means ‘Buffalo Hill’. Sulawesi Selatan Kurang Tinggi. permalink. Well, managed to get back to give this one a try sooner than expected. For those in Jakarta, check out the AirAsia flights to Makassar – the same price as Lion but much more likely to be on time (I spent an extra night on my last trip to Makassar sleeping in the airport thanks to Lion). Alas, the trip didn’t start well, with my co-hiker pulling out after I had agreed a price for a Makassar hiking club to take us there. Mol Yanti, a good organizer, was also absent (climbing Kerinci and also to Danau Gunung Tujuh), so her friends from YPUP were to help me out. I was ready waiting at 10am at the airport to be picked up (a late start, but enough time under normal circumstances). The boys finally showed up at 11.50am, just as I was about to cancel the whole thing and just take it easy in Makassar instead. The weather was brilliant. The traffic heading south towards Makassar was truly awful, so I was very thankful we were going north. Once off that busy trans-Sulawesi road that connect Makassar with Pare Pare (and on all the way up to Manado eventually) it was incredibly quiet, except for the occasional mosque or plane waiting to land in Makassar. It’s a lovely road, the southern one that snakes into the karst area. Bulusaraung looks like a worthwhile mountain in its own right, and takes only 2 hours or so to reach the top from the road. We were at the village that Mol Yanti and friends had stayed at the week before in order to ‘survey’ the mountain. As usual, I must have been the first foreign visitor in quite a long time. In the traditional Indonesian manner, we had to sit around for quite a while, despite it already being after 3pm. We managed to get started around 4pm with a couple of friendly village chaps accompanying us. The streamside camp spot was the sensible place to camp, given it goes dark around 6pm, though had the boys met me on time it might have been worthwhile continuing onto the ridge itself. Either way, it’s not too cold on this mountain, and we had no rain and met no leeches (Sept/Oct is the ideal time for avoiding both here) and I told the locals how I generally get a much better sleep on mountains than I do either in hotels or at home in Jakarta. Nothing like the sound of the night insect orchestra in a remote forest near the equator. As Mol Yanti had already told me they only got to around 14xx metres the weekend before, I was not really expecting to reach the true top this time. It would be, as many of my trips have been in 2013, a preliminary trip to gather more information for a second trip later. These regular day-jobs make it extremely difficult both to explore new areas unimpeded and also to deal with the ‘relaxed’ attitude towards time by most Indonesians. Next morning we were up at the ridge in just 2 hours from camp and it was glorious, sun shining through the vegetation, a light breeze, views over the steep edge of the ridge down to the villages and peanut fields. A place to hang around and savour. Alas I had to get back to the airport the same day, so after finding out what I could about the northern top (which was almost the same distance away from us at the southern peak as it had been the day before at the village!) we had to make a move. The ‘short-cut’ back down to camp was a little tricky in places, and the upper slopes are, in general full of spiky plants waiting to get you. Long sleeves and trousers and maybe even gloves are a great idea. Back down at the village, it soon became apparent that the locals would like to sit around and stare at the foreigner and ask the usual questions that one becomes accustomed to here. For a very, very, very long time. The boys from Makassar knew I had to get back for the flight but it’s bad manner to just get up and leave, everything should be done slowly, very slowly. So we had some food with them and more peanuts. And all this time I was thinking…. we still have to pay the local chaps for accompanying us. Anyway, it turned out they came for free. That is a rare occasion, perhaps I have only experienced it 4 or 5 times in 5 years of hiking here. So, many thanks gentlemen, I have a lot of respect for that sort of attitude that is not clouded by money. But, if you need some, please do ask. We made it back to the airport in record time (about 2 hours and 30 minutes) by taking the northern route via Desa Bantimurung out of the karst area. A shame what is going on at the edge near Desa Mangilu – lots and lots of quarry activity. After another bizarre 48 hour mountain reverie it was back to Jakarta for yet another wonderful week in the office. Had planned to visit this mountain and try to climb it this weekend but a fatal combination of illness, exhaustion and inability to find any hikers in Makassar with motorbikes and keenness to give it a try has meant that it’s a weekend of no hiking in Jakarta this weekend. 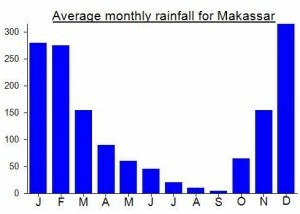 Strange how so little is know about this peak considering how close it is to Makassar. Will probably try to visit as part of an expedition across Sulawesi in 2014 or 2015.